Obituary – Wurtz, William “Bill” « Perry High School Alumni Association, Inc.
﻿- age 18, son of Mr. and Mrs. J. C. Wurtz, was born in Perry, January 1, 1923. He has attended Perry schools all his 12 years of schooling. He served as captain of the basketball team, and lettered in football and basketball. His hobby is sports of all kinds. The Lions’ award in basketball was awarded him during his high school career. He plans to enter some college after graduation. A memorial service for William “Bill” Wurtz, Sr. 83, of Joplin, Missouri, formerly of Perry, Oklahoma, will be held at 11:30 A.M. Saturday, November 18, 2006. Family and friends will celebrate his life and share memories at Tetik’s Country Barn, 9251 Frontier Road, Perry. Mr. Wurtz died of pneumonia on Thursday, September 28, 2006 in Joplin. As he requested, Mr. Wurtz was cremated and his ashes will be scattered in Joplin. Mr. Wurtz was born January 7, 1923 in Perry, Oklahoma, the youngest of five children of Jesse and Katherine Wurtz. 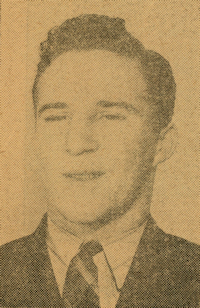 He graduated from Perry High School in 1941 where he served as captain of the basketball team, received the Lion’s basketball award, and was voted all-around athlete, participating in football and basketball. Mr. Wurtz served as a pilot in the Army Air Force during World War II, flying 45 bombing missions over Germany. He attended Northeast Oklahoma Junior College on a football scholarship, Oklahoma A&M College, and graduated from the University of Oklahoma with a degree in pharmacy. Mr. Wurtz worked for a number of years as a pharmacist as well as a manager for a pharmaceutical manufacturer. He was active in civic activities and the Presbyterian Church. Mr. Wurtz is survived by his daughter, Sandra Sue Wurtz, of Alexandria, Virginia; his son William Wurtz, Jr., of Austin, Texas; his sister-in-law, Phyllis (Clarence) Wurtz, of Perry, Oklahoma; two nieces, Linda Jackson, of Tulsa, Oklahoma, and Jean Ann Team, of Charlotte, North Carolina; one nephew, James Kehres, of Brejantown, Maryland; and 9 great nephews and 4 great nieces. His former wife, Lenora June Wurtz, of Issaquah, Washington, died in 2000. He was also preceded in death by his two brothers, Clarence Wurtz, of Perry, Oklahoma, and Jack Wurtz, of Columbia, South Carolina; his two sisters, Alta Kehres, of Dallas, Texas, and Mildred Myers, of Perry, Oklahoma; his brother-in-law, Robert Myers, of Perry, Oklahoma; and his sister-in-law, Katherine Wurtz, of Columbia, South Carolina.